…and $30 beer at an Indians game? 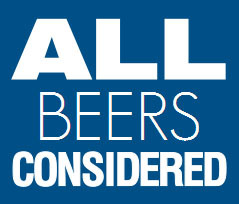 Did you know you can get the latest episode of All Beers Considered automatically? Choose from any of the below options, and don’t get left behind in this fast-moving world of craft beer. Posted in All Beers Considered.Tagged Avery, Baseball, Sam Adams, Top 50. Here’s a piece I did on the beer selection at PNC Park. the Pens new arena is an absolute joke when it comes to beer. Pens make this beautiful new arena and the “brewhouse” is all crap. They sell Rivertowne and some Penn Brew but its barely in stock. I asked aramark about it and they gave me the usual “we’ll look into it”. Each game I take a pic of their cooler as soon as it opens just to prove my point. Glad to hear that PNC recognizes the importance of craft beer at a ballgame, Father Spoon. I suppose you need SOMETHING to draw people to the ballpark when the main event is suffering through another Pirates game. Although, considering how my Sox have started the season, Fenway should probably consider hastily adding a lot more craft beers to their taps if they want to keep their vaunted sell-out streak alive.